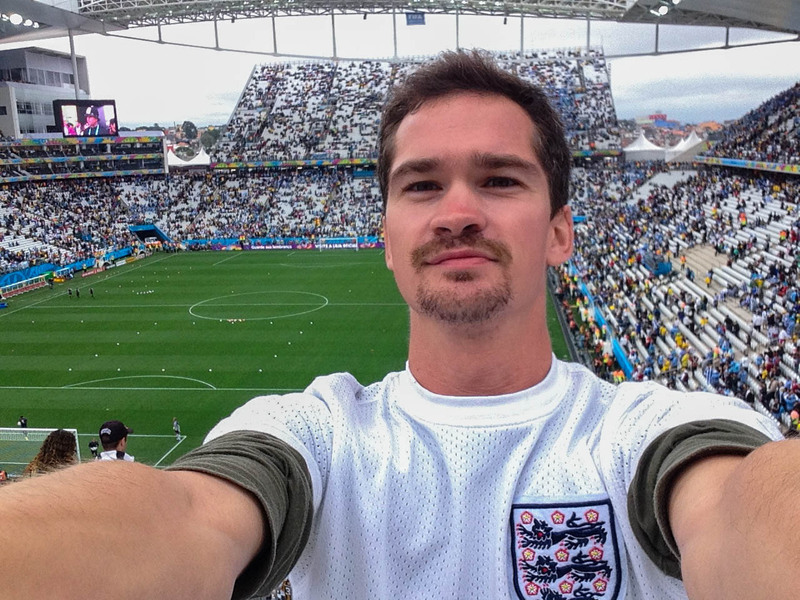 At the weekend the article below, about my experience at the World Cup, was published in the Brasil Post. Below is an English translation. At the beginning of this year I moved to Peru for work and in almost no time at all I developed a profound sense of saudades for São Paulo. It wasn’t that I disliked Trujillo, a small city on the northern coast of Peru, it was just that after two years living in Sampa, this monstrously beautiful city had started to feel as much like home as Londonhasdone throughout the rest of my life – a sentiment probably best exemplified by how I repeatedly found myself telling people in Peru about excited I was to be “returning hometo Brazil”for the World Cup. Unashamedly excited, I should add. As June approached I regressed in age by about thirty years;like my five year old self at Christmas I started counting down the days, thoughnot in anticipation of Santa but of the opportunity to fulfil a lifelong dream: attending a World Cup. The fact that it would take place in country known as the ‘spiritual home’ of football – and that which I now call my second home – as well as my fortune in being able to buy tickets for myself and my best-friend of twenty years who was flying over to join me, only further increased my giddiness.This was truly going to be the best month, ever. Not everyone seemed to share our enthusiasm, mind. A poll by Datafolha in April suggested only 48% of Brazilians supported hosting the World Cup, down from a high of 79% in November 2008. Given the protests of last June (and the smaller ongoing ones) and the subsequent debatesthat have raged about Brazilian society and politics, I guess this shouldn’t be too much of a surprise. It’s also not uncommon for the masses to feel a bit lukewarm about the prospect of hosting expensive major sporting events either. I remember being one of many who were entirely apathetic about London 2012…until I watched Danny Boyle’s wonderful opening ceremony whilst sat in a boteco in São Joao del Rey and instantly blubbered into my glass of Original whilst I was reminded why I love London so much. A week later, after three British athletes won gold on the same day inside the Olympic Stadium, I found myself one click of a mouse from booking a flight home to be there for the final week. The organisational apocalypse predicted by the media (Brazilian and foreign) probably didn’t help either lift the mood either.Stadium delays, construction deaths and the cancellation of some World Cup related projects, as well concerns around safety and security, corruption, favela evictions and police violence were all understandable concerns and issues absolutely worthy of balanced reporting. However, the relentlessly negative – bordering on hysteric – slant towards much of this coverage occasionally felt as if some agenda was being driven. But when the tournament actually started, what was the reality on the ground? Well, for me personally, my dream became a reality. Attending my first game between Spain and Holland (not a bad one eh? ), I’ll admit I felt quite emotional about the whole thing. Thankfully, that fantastic game went on to inspire four weeks of fantastic football…apart from those involvingmy England that is. Inside the stadiums there were some minor hiccups. Entering the Arena Fonte Nova for Spain and Holland for the first game in Salvador was pretty chaotic, and an expatriate acquaintance reported a similar experience in Brasilia two days later when he missed the first fifteen minutes of Switzerland and Ecuador due to epic queues. However, by and large, such issues were quickly resolved. Four days later in Salvador extra barriers and better stewarding meant I breezed through the same entrance into the stadium prior to the Germany & Portugal. Likewise, everything seemed fine in Brasilia when I was there ten days later to watch Portugal and Ghana. Away from the stadiums everything ran remarkably well, and the World Cup seems to have been a huge success. In terms of transport, I arrived back in São Paulo to Guarulhos on Monday 9th June, just three days before the tournament began, andI then subsequently flew or caught buses between SP, Salvador, Belo Horizonte and Brasilia. I didn’t experience one delay and the widely anticipated airport Armageddon failed to materialise. Within 20 minutes of touching down at Guarulhos I’d made my way through passport control, collected my luggage and was in a taxi homeward bound – something which, to be fair, I never anticipated would be possible given some of the hellish experiences I’ve had there in the past. In terms of safety I didn’t experience any problems, although that has been my experience of Brazil and South America since I first travelled here in 2007. However, we did hear of a number of people being mugged in Salvador, including one Englishman who was robbed at gunpoint by five youths. To be fair, he was drunk and wandering the back streets at 2am. Anyone who knows Salvador well enough, knows you probably shouldn’t be doing this. And overall, all the fans and foreigners we met and spoke to – Germans, Dutch, Spanish, English, Colombian, Algerian and even one Indian – couldn’t speak highly enough of their experience and how warmly they felt welcomed by Brazilians. A new Datafolha poll seems to support this, with 95% of foreigners rating their trip as excellent or good and the same percentage saying they would one day like to return. Additionally, 83% rated the organisation of the tournament as good or excellent whilst 69% even said they would like to live in Brazil – Lucas Podolski included, I imagine. Of course, visiting Brazil and watching football whilst spending off-days on Ipanema beach or in the Amazon arecompletely different experiences from the undeniable problems and frustrations those of us who live in Brazil experience on a day-to-day basis – and which most foreigners will unlikely encounter over the course of a month. Brazilians are hardworking, pay high taxes and often do not see full value in what they get back in return. Corruption remains a problem and bureaucracy can be immensely confusing and frustrating. The eighteen months it took me to process and receive my visa probably ranks as one of the least memorable experiences of living in Brazil. Additionally, Brazil’s Military Police, largely unchanged from the era of the dictatorship and catastrophes such as Carandiru twenty years ago, urgently needs reform (to be fair, any civilian service with the word MILITARY in it needs a reform). In light of this you can understand why Brazilians look at their public services and wonder why reforms and improvements cannot be made more quickly when twelve shiny new stadiums can be built for FIFA…don’t get me started on FIFA. But should ‘developing’ countries like Brazil be prohibited from hosting major sporting events? Should they be made to prioritise their public services and social problems, instead of building football stadiums? Should only rich, ‘developed’ countries like my own UK beallowed to host the World Cup? My answer, unsurprisingly, is no. In relation to Brazil, one issue I think needs addressing in relation to this is the complexo de vira-lata. In his book The Brazilians, Joseph Page notes that, ‘Brazilians are wont to ignore their own virtues and fixate on their shortcomings’. Indeed, it is common to hear Brazilians unfavourably compare Brazil’s (real or perceived) problems to ‘developed’ countries in North America or Europe – their analyses often portraying those countries as being utopian beacons of hope and prosperity. No-one questioned the ability of London to host the Olympics following a week of nationwide riots in 2011 year. And those Olympicscost the UK £9 billion (R$34 million) at a time of economic austerity in which billions have been cut from public services – an effect I felt personally in February 2012 when my job was closed and social work team shutdown. It’s one of the reasons I moved to Brazil. A few days before the World Cup started, my wife was invited to appear on special feature on Brazil on the BBC’s Today programme, which is widely regarded as the most influential news and political radio programme in Britain. In it, presenter Evan Davis – the former BBC Economics Editor – pondered why Brazilians were so unhappy, as from an economics point of view Brazil is doing well and heading the right direction. Similarly, ‘Brazil’, as Kenneth Rapoza notes in this article, ‘is better than Brazilians think. It is not better than the U.S. or France or Italy. But it is better than the Brazil of 2000’. Brazil of course faces many challenges but we should perhaps also remember how far it has come as a young democracy. It’s for this reason that Brazilians should rightfully bask in the glory of their World Cup success (off the pitch anyway).